»I've been cited in three recent publications: Terry Freedman's Coming of Age in an article by Alan November; the Working Toward Excellence Journal Spring 2006 issue, published by the Alabama Best Practices Center -- Educating the Digital Generation (this evolved out of my ongoing collaboration with Sheryl Nussbaum-Beach); ISTE's Learning & Leading with Technology, May 2006 issue in an article by Frances Jacobson Harris. Cool. »I wish I could be here and there. »Terry Freedman is doing a series of info-posts about how to use Flickr Toys in an educational setting. »My class' wiki solution manual projects are winding down. My department's new planning wiki is winding up. (Sorry, that one is private ... for now. ;-)) One of my AP Calculus students has left the country. She's completing her take-home exam online using a wiki she created. »We had our first BPRIME workshop using the new format. Feedback so far has been very positive. The next (and last one for this year) is on June 26. »Matt Ready is the founder of Vaestro (rhymes with Maestro). "Education" is the fastest growing and largest category of audio channels. Matt has a vision for how it can be used in education. I've got a blog post reply still in draft form. The days are too short. This is a bit late but I’m going to be hosting a Skypecast with Darren, Clarence and Kathy at about 10:30EST on Wednesday, May 31st. The discussion will revolve around the new story of their classrooms. Originally I had planned a closed discussion and would podcast it later. I’ll still record it but wanted to see if others were interested in listening in and asking some questions. I’m not sure how many we can handle but I’m willing to give it a shot. So if you’re interested, you can find me in the Skypecast directory. Chris Harbeck teaches grade 8 math in one of our feeder schools. Normally, high school teachers don't really know or work with their feeder school colleagues on a regular basis. Chris has been working with me and my students almost daily. He's been commenting on our blogs and inducting students into The Scribe Post Hall Of Fame; his and mine. Chris liked the idea of a Hall Of Fame so much that he has created The Growing Post Hall Of Fame. What's a Growing Post? A Growing Post is a cumulative assignment that allows the students to have a review document of the unit they are taking. 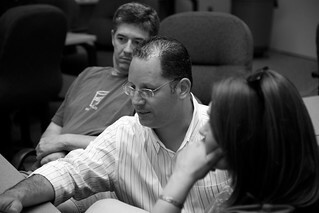 Students are given a set time period to complete their post. They are encouraged to include pictures and links as well as text to explain the questions being asked. If a student is unable to complete their work online a paper version of the assignment is accepted. When Chris created the Growing Post Hall Of Fame he included a column called Reason for Induction. I liked this idea so much that I've just done the same in The Scribe Post Hall Of Fame. This is what's great about collaborating and sharing our ideas. Chris likes what I do, develops the idea further which pushes me and I learn from him. Rinse. Wash. Repeat. In my recent podcast with Dean, he asked me "How do you get into the Hall Of Fame?" I didn't give a very clear answer. I'm still working out exactly what the criteria are for a post to be inducted. Looking at Chris' list of reasons for inducting students has started to give my thinking some focus. When all the posts listed have reasons I'll be able to articulate a better answer to Dean's question. One of the things I'm struggling with now is the increasing volume of student scribes that are being inducted into the Hall Of Fame. Shouldn't induction be a rare occurrence? Shouldn't it require significant effort on the part of the inductee to be considered? But the students are doing increasingly excellent work, don't all students making this sort of effort deserve the recognition associated with being in the Hall Of Fame? Maybe we should just keep inducting the incredible work students are doing; generate a comprehensive list of outstanding work and follow up in June with The Scribe Post Awards. Maybe have a short voting period and give special awards to the top three (gold, silver and bronze badges). We'll let the students and their audiences do the voting. It's probably best if I stay out of it. I'm feeling less and less qualified to judge the work done at this level. How do you choose who is best when it's all so well done? Dean is putting together a series of four podcasts on the Telling The New Story theme that David Warlick has been writing about. He's interviewing three teachers (high school, middle school and elementary) that make use of web 2.0 tools and resources in their teaching practice. The fourth podcast will be a wrap up including Dean and the three teachers. I had the good fortune to be one of the three teachers Dean has asked to participate in the project. Let us know what you think by leaving comments here or over at Dean's. Dean has just posted Telling The New Story Part 2 - a podcast with Kathy Cassidy who teaches grade one in Moose Jaw, Saskatchewan. Dean has just posted Telling The New Story Part 3 - a podcast with Clarence Fisher who teaches grades 7 and 8 in Snow Lake, Manitoba. Part 4 with all of us together is coming some time next week. I had completely forgotten about this conversation I had with one of Sheryl's classes of student teachers back in February. It came about because I had spoken to Sheryl about inviting her students to mentor mine. This is the idea that eventually grew into The Mentorship Project. Anyway, Sheryl recorded it and has just released it as a podcast. The whole thing is 19 minutes 42 seconds long; a wma file, 4.6 Mb download. You'll hear me talking really fast at the start -- I was trying to cover a lot of ground in 15 minutes and didn't want to usurp too much of Sheryl's class time. Sheryl put together a list of show notes; a topics list of what we talked about. Leave us comments here or on Sheryl's post. 1. Why his students are passionate about blogging and how would they feel if their blogs went offline. 2. How people learn. What is real learning? 3. The preservice teachers push back---and ask Darren the "tough" questions. 4. How tough is student teaching? 5. Loss of human contact--myth or reality? 6. How blogging can make you popular in class. 11. The power of a comment-- and kids who are "totally juiced"
12. Mentoring project-- Is it all math? The main objectives of the publication are first to inspire teachers to want to try some of these "new tools" for themselves and with their classes, and then to provide practical advice and guidance on how to do so. 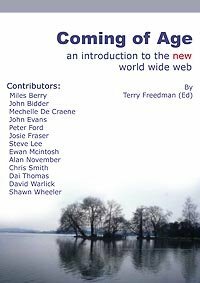 Terry has also put together a wiki to keep the project growing and a superglu page to keep up with discussion of the book across the blogosphere. I've had the book copied and distributed to all the teachers in my department, our administrators and a couple of other teachers I know who might be interested in learning about "all this stuff." I'd like encourage you to do the same in your school. Badges? We don't need no ... uh ... actually, we do. The Scribe Post Hall Of Fame has grown into an incredible resource in a very short time. (Take a look.) And there's a palpable excitement about it in the Pre-Cal 40S class. There has been a six day string of the most outstanding scribe posts ever written. I'm looking forward to seeing how this week unfolds. Chris Harbeck has added students from his grade 8 classes and a few others from other teacher's classes. The impact this will have on the students will be immeasurable; inducted into the Hall Of Fame by someone they don't know. How would you feel if this happened to you? There is a page on the wiki that is really for teachers. I've put together a bit of a "how to" page for teachers that would like to explore the use of scribe posts in their classes. In the last week or so I have found myself talking to my classes about their wiki projects differently. The initial concept was more about generating a learning resource; a solutions manual to accompany their textblooks (sic). Now I find myself emphasizing the nature of learning that takes place when they make their "Constructive Modifications" as the real purpose of this assignment. David Warlick has been emphasizing that the jobs for which the school system should be preparing our students do not yet exist. More than that, no one knows what they will be. One thing these "new jobs" will have in common is that they will be in the nature of "knowledge work." It wont be as much about what you know as it will be about what you do with that knowledge. In December we had a career day at our school. We had over 50 professionals in the building describing the pursuit of different careers. We had RCMP officers, doctors, graphic artists, business people, people representing all sorts of opportunities. There was one common thread in every presentation. What kids learn in school today is secondary to them learning how to learn. The attitude of business is: "We'll train them with what they need to know. You just teach them how to learn." Even the RCMP officer emphasized several times that an important part of the application would be evidence of life long learning. He said: "We don't really care what you're learning as long as you can demonstrate that you're continuing to learn." As I said in the discussion over at Clarence's blog; this ties in with the idea of Assessment As Learning. The kids think the "Significant Contribution" is the hard work. This week I've explained to them that the purpose of the "Significant Contribution" is there for a variety of reasons, but mainly to enable them to make their "Constructive Modifications" which is the real hard work. A "Constructive Modification" must be an edit of someone else's work. In order to make a "Constructive Modification" that moves the project forward in a constructive way they have to scan through much of their classmates work. Think about it critically. Assess it for accuracy, clarity and presentation; and then decide what they will do to modify it so that it is better than it was before. The actual content generated this way may be small, in comparison to a "Significant Contribution," but it requires deep metacognition and critical analysis -- an awful lot of thinking and (hopefully) an awful lot of learning. Thanks go out to Chris Harbeck, Lani Ritter-Hall and Graham Wegner for leaving postivie comments on Michael's, Janet's and Jefferson's scribe posts. The impact has been dramatic. Marc was scribe today. I didn't think it possible, but he raised an incredibly high bar up another notch. Just a thought: I wondered about a Scribing Hall of Fame to which everyone could aspire. It seems to me that you, Janet and Michael should be the initial inductees. You have set such high standards!! Maybe the members of the Hall of Fame could even have mention of their membership in their profile image. Lani also suggests there should be some way to mention student's membership in the hall of fame on their profiles. This made me think of a badge. We could brand the wiki with a large one and each student's post entered in the hall of fame could have a smaller version pasted into their winning post. A simple but elegant graphic, in conjunction with the wiki, can achieve all the goals outlined above. I'm not much of an artist. How about you? Then again, maybe we should have a student graphic design competition ... hmm ... I'm going to suggest it to the graphic arts teacher at my school. If you do the same in yours we might really get something going here. What do you think? There's an interesting dynamic evolving in the Pre-Cal 40S class. Over the weekend Michael wrote a scribe post that was head and shoulders beyond any that has come before. I clicked on the comments link but couldn't find the words. I figured I would highlight it in class. When I did I went a little overboard and titled Michael the Emperor of The Scribe Post. Every time Michael has scribed, Janet has followed him. He has had difficult lessons to scribe; serendipitously she has easy ones. The "joke" was that I should plan the next class to give her something to "really sink her teeth into." But that's just not where we were in the course. The thing is, Janet wants to be Emperor of The Scribe Post, she wrote a post that I think is good enough, given what we did in class yesterday, to be Emperess of The Scribe Post. Michael had a weekend, Janet wrote her scribe over night. Michael had a class rich in content to work with. The class Janet scribed was a skill building class; no new content. Don't get me wrong; Michael's scribe was outstanding ... and so is Janet's. for me about this wiki project my classes are working on is NOT correcting their work.